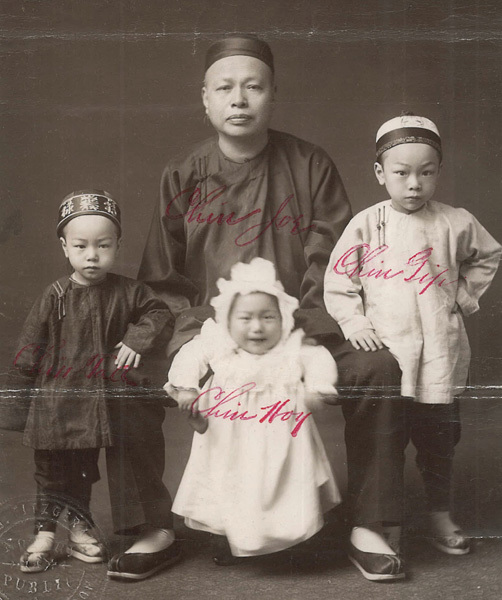 “Chin Joe family portrait,” 1903, Chinese Exclusion Act case files, RG 85, National Archives-Seattle, Chin Joe file, Sumas, Box 14, Case 247. After attending the “Chinese Genealogy Seminar” in March 2016 at Oregon Historical Society Research Library in Portland, Darby Li Po Price of Berkeley, CA was inspired to search for his family’s exclusion files at the National Archives-Seattle. With the help of the staff he found six files including one with a beautiful 1903 photo of his great-great grandfather Joe Chin and three of his children which was part of an application to return to China to find a second wife after his first wife died. Joe’s file includes extensive interviews with descriptions of family life and residences in both China and Portland, as well as his original 1872 entry in San Francisco with his first wife (whose file Darby will search for at the National Archives-San Francisco-San Bruno). Pictured in 1903 are Joe Chin and the three youngest of nine children from his wife Mon Du Shee whom had recently died. This is part of Joe’s application to go to China to find a wife to attend his children so he could manage his store. Upon returning the next month from China after marrying his second wife, his re-entry was denied. His store was suspected to be “the headquarters for gamblers and lottery dealers” and his identity suspect because his given name was “Chew” on his certificate of residence, “Joe” on other papers, and as “Jew” by a court interpreter (Joe said the differences were misspellings into English by officials). Moreover, he did not have documents for his initial entry in 1872 (not required prior to the Chinese Exclusion Act which went into effect in 1882). Two years later Joe was re-admitted after several white men testified on his behalf. Chin Joe was formerly a member of the firm of Lun Chong & Company, 130-1/2 Second Street, Portland, Oregon. The name of the firm was changed to Bow, On & Company in 1902. They dealt with dry good and clothing. Currently he was a manager at Gum Wah & Company. D. C. Lounsberry, a White witness for Chin Joe stated that he had known Chin Joe for about twenty years. Lounsberry was formerly the deputy sheriff for the city of Portland in charge taking a census in 1885 of all Chinese persons residing in the city for the purpose of collecting poll tax. He held this position for eleven or twelve years and got to know all the Chinese merchants. In 1903 Lounsberry was a watchman at the Burnside Street Bridge. James B. Sinnott, age 35 and born in Portland, swore in an affidavit that he had known Chin Joe for about fifteen years. Sinnott worked in the Sheriff’s office from 1891 to 1896 and assisted in collecting the Chinese Poll taxes. Robert Holman, an undertaker in Portland for the Edward Holman Undertaking Company, submitted a copy of the invoice for $116.00 for the burial of Doo She, Chin Joe’s deceased wife. It is well explained and a fascinating non-fiction story about your family. You should ( just a suggestion or advice), write a book of your family ( father and mother side) from the 1800 to these crazy days. Hug with good energy my dear friend!!!! !